Deepak is a Graduate in Electronics & Telecommunication Engineering (E&TC) from University of Pune. 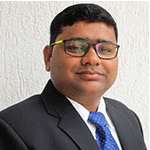 He is also a qualified lawyer from University of Pune and Registered Patent Agent (IN-PA-2052) with Intellectual Property Office, Government of India. Deepak is an expert in drafting Patent Specifications for Electronics, Mechanical, Communication and Computer/Software related Inventions. Deepak has extensive experience in Drafting Patent specifications that qualify Patent Eligibility criterion for major patent offices like US, Europe, China and Japan apart from India. He has also handled prosecution of patent applications and has responded to office actions that have resulted in grant of many Patents. Deepak has conducted State of the Art /Prior Art Searches, Invalidity Searches, FTO searches and Claim Mappings that have helped clients to launch IP oriented Products and solutions in India and overseas. Deepak with his extensive knowledge of claim mapping and Infringement analysis provides technical support to the litigation Attorneys Practicing in US and Europe. Deepak has overall 10+ years of experience in IP Industry. Deepak advises clients on a wide variety of IPR matters, including licensing, prosecution and enforcement strategies for issued patents. He speaks frequently at events and forums on IPR Matters.